Within just a few weeks of the 50th anniversary of Barbra Streisand's first No. 1 album, "People," which topped the charts in October 1964, Streisand has set a new record with her 10th No. 1 album — becoming the only artist to have had a No. 1 album in each of the past six decades. This new album, "Partners," features duets with some of the world's greatest vocalists — Babyface, Andrea Bocelli, Josh Groban, Billy Joel, John Legend, John Mayer, Lionel Richie, Blake Shelton, Stevie Wonder, even Elvis Presley. And yet, for Streisand, perhaps the most thrilling part of this creative work was recording a duet with her son, Jason Gould. Mother and son performed together live in 2012 and 2013, and their duet of "How Deep Is the Ocean" now makes its appearance on "Partners." 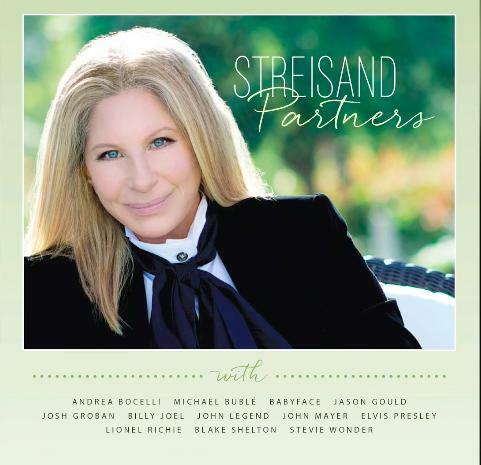 Rounding out the album are some of Streisand's best-known tunes: "People" with Stevie Wonder, "The Way We Were" with Lionel Richie and "Evergreen" with Babyface. Ironically, Streisand — the Oscar-winning, Emmy-winning, Grammy-winning and Tony-winning performer who has sold 245 million albums worldwide — claims she doesn't love to sing, at least not in front of other people. “I love to sing in a recording studio,” she told Yahoo Global News Anchor Katie Couric. “It's just because there's nobody watching.” Then, it can be just her and the music. Still, this notoriously private person isn't afraid to go public on issues she cares about, whether it's gay rights or politics or women's heart health. In recent years, cardiac disease in women has become a major focus of her philanthropy, including personal contributions of $10 million to endow the Barbra Streisand Women's Heart Center at Cedars-Sinai Heart Institute. We'll have lots more on that, and some exclusive glimpses of her new campaign, in the coming weeks.